A cleft lip or cleft palate, also known as an orofacial cleft, is a common birth defect where the tissues of a baby’s lip or mouth do not fully develop before birth, resulting in a distinct gap in the upper lip that can extend up to the nose. It’s estimated that one in ever 700 to 800 babies in the U.S. is born with some degree of a cleft lip or palate. Unfortunately, orofacial clefts cause more than just an irregular appearance, since they can also lead to difficulties with a baby’s ability to eat or speak throughout their life. If the cleft is not repaired, it is also possible for the child to develop hearing loss later in life, and be at increased risk for ear infections and serious dental issues. At the pediatric dental office of Dr. Jacob Myers, we provide corrective treatment for cleft lips and palates to the families of East Lansing, MI and the surrounding communities, giving their babies the chance to live a healthy, normal life full of radiant smiles. To learn more about cleft lips and palates, as well as how they are treated, check out the information below. Before a baby is born, the basic tissue structures of their mouth form, from the jaw and gums to the lips and palate, commonly referred to as the “roof of the mouth”. 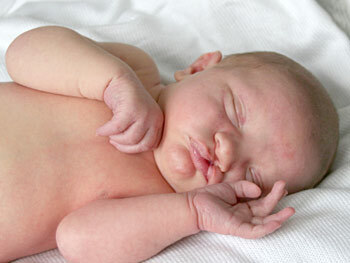 In some cases, the tissues for upper lip and palate do not form completely before the baby is born, resulting in a cleft. It is possible for a cleft lip and palate to occur separately or together, with the severity of the cleft varying on a case-to-case basis. Before the cleft is treated, the child should see a pediatric dentist first to get a full diagnosis for the severity of the cleft, which will allow the doctor to begin forming a plan for the necessary treatment. The treatment itself is handled by a team of doctors, which will include a pediatric dentist, oral surgeon, orthodontist, plastic surgeon, and other oral healthcare specialists. The main objective for treating a cleft lip or palate is close the gap and restore natural function to the mouth. The most reliable treatment method to accomplish this is through surgery, which the child should receive within the first two years of life for the best chance at restoring full function to their mouth. During the procedure, the surgeon will use intravenous sedation or general anesthesia to ensure that the baby does not experience any pain. To restore a cleft, an incision is made on each side of the cleft to create several flaps of tissue, which are sutured (stitched) together to close the gap. Since the surgeons plans out the incisions beforehand to have them follow along the baby’s natural facial contours, the scar from surgery after that baby’s lip has healed will be very subtle if visible at all. This procedure typically performed when the baby is between 2 and 9 months of age. Treating a cleft palate is more complicated that repairing a cleft lip, since it is necessary to rebuild soft tissue, muscle, and bone to achieve a healthy structure for the palate. Despite there being more for the surgeon to repair, the same “flap” technique is used to repair the palate as is used when repairing a cleft lip, with the surgeon making small incisions and repositioning the soft tissue to close the gap. After the surgery for a cleft palate, the baby may need to wear a special oral appliance to guide the oral development as they get older. Some dental appliances used following a cleft palate surgery include obdurators (artificial palate) or a nasal alveolar molding devices (NAM). Bone Grafts - small amounts of bone will be taken from other parts of the jawbone and used to repair the supporting bone and hard tissue of the palate. This treatment would occur between ages 8 and 11. Orthodontic Treatment - kids that had a cleft lip or palate may be at greater risk of misaligned teeth which would need to be corrected with orthodontic appliances like braces or Invisalign around the age of 12. Corrective Jaw Surgery - Orthognathic surgery repairs server misalignments or development issues with the jaw to ensure that your child’s mouth is functioning properly, while preventing the development of future oral health issues. Speech Therapy - Even if the cleft lip or palate is repaired, some issues with speech may still develop, but these issues can often be corrected with speech therapy. Contact Your Local Pediatric Dentist To Learn More! While handling a child’s cleft lip or palate can be scary, intimidating, and challenging for any family, just remember that it’s a very common birth defect, and getting your child treatment can completely restore their oral health so they can live a healthy, happy life with a perfect, normal smile. All you need is to bring your kids to a place where you can be confident that their oral health is in most experienced hands, and that place is the pediatric dental office of Dr. Jacob Myers. If you have any questions about cleft lips and palates and the treatment available, or if you are looking to schedule an appointment for your child’s initial examination, just contact us to speak with a member of our team, or use our online appointment request form. For years, we have been the trusted provider of pediatric dental care to the families of East Lansing, MI, and we look forward to providing you and your family with the high quality care that our practice is known for.